Reminder – dates for the diary! Just in case you have not seen the posters, or received the email, there are a couple of dates coming up to remind you about. Sunday 27th October – 2:30 pm; Afternoon Tea in the McCandlish Hall, Straiton. Put down your reading glasses, and pens and come along for a cup of tea and a bite to eat. Find out how the Linfairn campaign is progressing and what needs to be done for the remaining 2 weeks. Raise any questions, concerns, and maybe even have a bit of a chuckle at some of the ‘howlers’ that have cropped up in the Planning Documents so far! Tuesday 29th October – 7:30 pm; Crosshill Information Evening, Crosshill Community Centre. A number of concerns have been raised from our neighbours in Crosshill, particularly with regard to access routes and traffic. This session is an opportunity to bring people in Crosshill (and anyone else who would like to come) up to date with the proposal and the objection process so they too can make their feelings known. SSfS look forward to seeing you there! Many thanks to MEP Struan Stevenson who has sent in his objection to Linfairn Wind Farm, the first of our representatives to do so. Watch his latest video about wind energy. An application for a single turbine has been made to South Ayrshire Council at Glenauchie in the upper Girvan valley. A single turbine might seem small beer compared with the Linfairn wind farm proposal: however the fact remains that the proposed Glenauchie turbine is 77m high – which is 253 feet, and so it far exceeds the height limits set by South Ayrshire’s own guidelines. It would be easy, but wrong, to ignore the Glenauchie application simply because it is in the shadow of the Linfairn application. It would set a precedent for developers to try bypass the planning guidelines which exist. The closing date is officially past, but comments are still being accepted. You could also point out the turbine’s proximity to the designed landscape of Craigengillan estate, and its proximity to the Galloway Forest Park, the Galloway Forest Dark Sky Park and to the Galloway and South Ayrshire Biosphere. It’s time to put pen to paper! Well folks, you may well now have digested some of the hair-raising Linfairn Windfarm planning documentation, seen the recent articles in the local papers, posed for the obligatory ‘horrified residents’ photo call, and received the SSfS newsletter. It’s been a busy week! Despite developers having years to prepare their documents, the good old public only have a 28 day window to respond. In our case, we have until the 11th November 2013. To make it as easy as possible for people to make their feelings known on this proposal we have prepared a How To Object page for you. Within 35km of the windfarm, less than 10% of the ‘receptors’ considered (residents, tourists and passers through) would experience ‘no impact’ from this proposal, with many of them experiencing ‘significant [adverse] impact’. The proposed access route (predicted to carry an additional 40,000 vehicles throughout construction) comes within metres of the conservation village of Straiton, crosses several well used local footpaths, and cycle routes, and ploughs through a field which is also home to one of the local fishing club’s most popular Salmon beats. If anyone is in any doubt as to the size of some of these vehicles you can have a look at this clip of a lorry carrying one turbine blade being transported in Skye. This traffic will also be coming through Maybole, cutting off at Kirkland Street, which houses 2 primary schools and already has recognised traffic issues. The route continues through Crosshill paying no heed to the National Cycle Network (Route 7). Funnily enough, there has been no consultation with the residents of Straiton, Crosshill, or Maybole who are to accommodate the impact created by the additional 40,000 vehicles expected to pass through during construction. Of 20 photomontages, only 4 are within 5 km of the site, 3 of which are side-on views and appear to be carefully chosen for their ‘screening’ qualities. There is not one honest photo representation provided for a frontal view of the project from anywhere along the valley and widely used local core paths. As a resident within 5km you only considered to be adversely impacted if you have a window facing either of the 2 sites. A full view of some or all turbines from your garden or outside your house does not count. If you would like to see if you are within the ‘significantly’ impacted category you can check the LVIA (p47). If you think you may have been missed, then let us know! These are just some general issues, there are in truth many more. Several people have raised points with us and along with some of our own we have put them together with some information on how to object. We only have one shot at this, so please make sure your voice is heard! Our latest newsletter is packed with information about Linfairn with maps showing the location, a description of the access route and how this project will affect one of the most beautiful areas in south west Scotland. To download your copy click here. Roll up for a photo call tomorrow – Sat 5th October! If any of our local supporters can come at short notice, it would be great to have as many of you as possible join us at the Buck, in Straiton, tomorrow (Sat 5th October) at 12:30pm for a photo with the Ayr Advertiser and Carrick Herald who are running a story on our campaign next week. SSfS has already had some press attention from the Ayrshire Post this week, after Bill Steven told it like it is, in response to Willowind lodging their Section 36 planning application for Linfairn Windfarm. 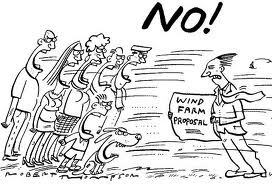 .. ‘Their community engagement has been pathetic, with absolutely no contact made with the many people who will be directly impacted by this windfarm‘…You can read the full article here.